U.S Defense Secretary Jim Mattis, left, and French counterpart Florence Parly attend a joint press conference in Paris, Turesday, Oct.2, 2018. Some fear the strategy opens the door to strikes on Iranian forces inside Syria — and direct armed conflict with Tehran. Trump administration officials escalated their campaign to counter Iran in a slate of diplomatic announcements on Wednesday, punctuating a week of warnings that have ratcheted up bilateral tension and further fueled speculation that the United States is inching closer to an armed conflict with Tehran or its proxies’ fighters in the Middle East. The imbroglio began a week ago on the sidelines of the United Nations General Assembly’s annual opening session in New York. For years, the Pentagon has claimed that U.S. troops are in Syria for one purpose: to fight the Islamic State. Officials insist that American forces are not there to fight in the ongoing civil war in that country, which for eight years has been fought by a tangled web of foreign alliances that includes thousands of Iranian and Russian fighters backing President Bashar al-Assad’s regime. But a series of tough-on-Iran remarks from National Security Advisor John Bolton raised questions about whether the military’s mission in Syria and beyond is expanding to include countering Tehran. Bolton told reporters that the U.S. would not be leaving Syria “as long as Iranian troops are outside Iranian borders.” In separate prepared remarks, he vowed that the U.S.“will come after you” if Tehran continues to “cross” the U.S.
On Wednesday, Secretary of State Mike Pompeo blamed Iran for threats on American personnel in Iraq and withdrew from an Eisenhower-era “treaty of amity” with Tehran that has been used by both countries as the basis for resolving claims in the International Court of Justice. The Trump administration has made constraining Iranian influence in the Middle East a core pillar of its foreign policy in the region. In a dramatic press conference a few weeks into his presidency, then-national security advisor Michael Flynn announced that the administration was “officially putting Iran on notice”—with little explanation of the practical impact of that announcement. In May, President Donald Trump withdrew from the so-called Iran nuclear deal, which traded sanctions relief for curbs on Iran’s nuclear weapons development program; the full weight of the re-imposed sanctions will flip on in November. The U.S. is involved in several conflicts beyond Syria where Iran-aligned forces also are active. In the ongoing civil war in Yemen, the Pentagon is providing intelligence and targeting support to the Saudi-UAE coalition battling the Iranian-backed Houthi rebels. 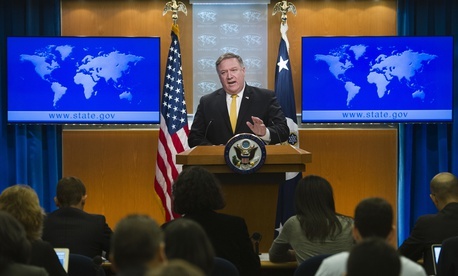 U.S. officials insist Iran has smuggled to the Houthis ballistic missiles and IED drone planes and boats used against American, Saudi, and Emirati military and civilian targets, including commercial ships of Yemen’s coast. In Iraq, the State Department is working to exclude Iran-aligned politicians from the as-yet unformed government while the military continues to provide training and other assistance to Iraqi security forces. There, the situation is particularly complicated: an Iran-aligned group placed second in national parliamentary elections in May. Currently, Congress has passed no legal authorization for U.S. military forces to directly engage with Iranian or Iranian-backed groups, raising questions from lawmakers about the administration’s intent. 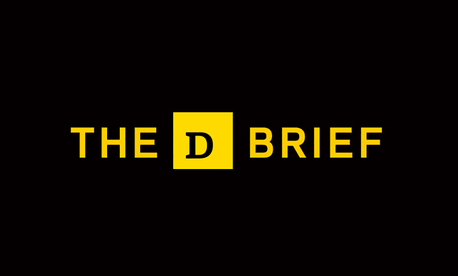 Defense Department officials have struggled to explain Bolton’s remarks and the of how the Trump administration intends to constrain Iran across the Middle East—and what role the military will play in that effort—remains unclear. So far, U.S. military personnel operating in the region have received no new guidance from Washington. Officials from Defense Secretary James Mattis down to U.S. Central Command, or CENTCOM—the operational component of the military responsible for American troops in the Middle East—still say that the military is solely tasked with countering ISIS. “Militarily in Syria, we remain focused on defeating the remnants of ISIS and stabilizing liberated territory to prevent the group’s resurgence,” CENTCOM spokesman Maj. Josh T. Jacques said in an email. Col. Sean Ryan, spokesman for U.S.-led forces in Baghdad, this week also said he had received no change in guidance to support a new agenda on Iran. U.S. officials long have said that the U.S. military presence in Syria plays a role in the administration’s Iran strategy. 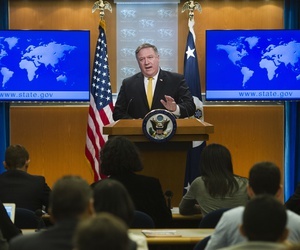 Boots on the ground there “can constrain Iran’s freedom of maneuver” and “empower our diplomats to put more pressure on Iran,” Assistant Secretary of Defense for International Security Affairs Robert Karem told a House Armed Services subcommittee last week. He argued that these are only incidental benefits, not the operational purpose of the troop presence. The escalation in rhetoric and the growing fears of military engagement come at a paradoxical moment. The U.S. is also drawing down some of its defensive capabilities in the region, removing a handful of Patriot missile batteries from Gulf allies. Pentagon officials have tried to give a more nuanced explanation of Bolton’s comments, describing the removal of Iranian influence from Syria as a necessary byproduct of a political settlement to the war that will prevent the re-emergence of ISIS. In other words, officials suggest, the departure of Iranian military groups from the country is part of a whole-of-government strategy for creating an ISIS-free Syria—and not a new military mission. Mattis and others have emphasized the role of the U.S. diplomatic corps in Syria while denying a broadening role for the military. 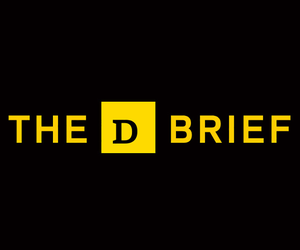 On Tuesday, the secretary announced in Paris that the U.S. has doubled its diplomatic presence in Syria—a somewhat unusual announcement coming from a defense secretary, rather than a State Department official. He did not give specific numbers. The U.S. does not provide consular services in Syria. Robert Ford, former U.S. ambassador to Syria from 2010 to 2014, said the fight against ISIS has “metamorphosed” into “putting pressure somehow, in some undescribed, not-detailed manner” on Iran. In Iraq, one former U.S. official with deep experience in the Middle East raised concerns that the administration’s public posturing towards Iran might make the security situation there worse and put Western civilians in Iraq at risk for targeting. “What I’m most concerned about is if the Americans say we’re going to push back on Iran in Iraq, they’re going to fight asymmetrically,” the former official said. Lawmakers, meanwhile, have zeroed in on Trump’s legal authority to strike Iranian forces. Karem confirmed that the administration does not interpret the 2001 Authorization for Use of Military Force, or AUMF, to cover engagement with Iran, and insisted that the U.S. military force is focused on fighting ISIS. But those arguments did not soothe concerns from Democrats. In what could later prove to be the most important development of the day, the Pentagon’s internal interpretation of its legal authority to carry out tactical strikes in the context of “collective self defense” was made public. According to an excerpt of a letter from Mattis sent to Sen. Tim Kaine, D-Va., the Defense Department believes that collective self defense—a legal principle that lets nations use military force to defend allies—gives it the authority to carry out strikes in defense of partner forces even if the target of those strikes is not covered by a congressional AUMF. Kaine has raised questions about the process by which the Defense Department determines who is a “partner force,” suggesting that the Pentagon could simply slap the designation on any group it wished in order to carry out airstrikes on a desired target in the name of collective self defense. It’s also an expansion that could theoretically be used to justify a strike on Iran or Iran-backed forces. Gen. Joseph Votel, the head of CENTCOM, denied that possibility on Thursday. “I don’t think we’re seeking to go to war with Iran,” he told reporters.